With food costs rising and cities relaxing rules for keeping small livestock in urban settings, more people are showing interest in having backyard chickens. Even half a dozen hens will lay enough to give an average small family plenty of fresh eggs. Housing for a small flock needn't be elaborate, and with an adequate-size yard in which to forage, feed costs are small as well. If you lived in the tropics, chances are your chickens -- whose ancestors originated in jungles -- would roost in trees for protection from predators, and the mild, year-round climate would allow them to do without much in the way of housing. However, for most chickens not living in their native habitat, protection from predators and the elements is necessary. 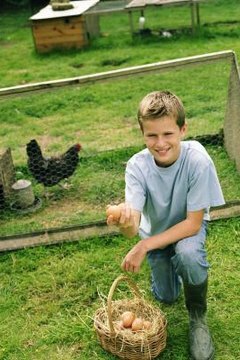 In addition to providing them with a warm, dry house, you need to give your chickens a quiet nesting area for laying their eggs. You must also provide nutritious food and fresh, clean water daily. Before grabbing a handful of nails and some boards, carefully research a hen's housing requirements based upon the number and the breed(s) of chickens you plan to keep. Allow a minimum floor space of 18 inches square for each hen -- preferably 2 feet or more, especially for large breeds. Consider the size and position of things like nest boxes, feeders, water bowls and so on. Plan to face the coop toward the south for light and away from chilling winter winds, and allow for plenty of year-round ventilation in the design. Almost any wood or plywood will work for building a coop, as will many metal or plastic materials. The main considerations are ease of cleaning, rot- or rust-resistance and durability. Painting wood and metal surface with a non-toxic exterior paint is a good way to add life to the materials as well as make them easier to clean and more aesthetically appealing. White or pale colors on the inside also brighten up the interior where the small space makes electric lighting impractical. If you aren't particularly handy, you can still make a chicken coop for a few hens by converting a large dog house or small storage shed for their use. Elevate an ordinary large wooden dog house by screwing posts to the sides on each corner, then build a ramp for them to enter. Putting it up high allows you to enclose the space below the house with wire as part of the hens' outdoor run and creates a shady spot for them to get out of the sun or take shelter from rain. A tool shed needs only interior modifications of perches, nest boxes and so on, and an outside run. As long as your hens are safe and have all the things they need inside, they don't really care what their chicken coop looks like on the outside. That lets you be a lot more imaginative with the exterior look of their housing. Inventive folks have even turned old vehicles into chicken coops, so put your creative brain in gear and look around for things you can convert to a one-of-a-kind backyard coop.